When husband and wife, Eve and Patrick Gantly, discover a shocking secret from Patrick's past, they make the difficult decision to use the old lantern once again to return to 1885. They hope to save his child from a tragic future. Although they try to plan for every possible contingency, something goes wrong. They lose each other and end up in a different time! Nothing goes as planned. They struggle to save Patrick's daughter from certain death, even as they search for the lost lantern that will return them to their own time. I love time traveling books and Xmas books so this was one I had to check out. Plus, I adore that cover. Lovely! I did not read book 1, but that is okay. This did well as a standalone. There was some backstory missed, but the author did a good job of getting the reader up-to-speed and knowing as much as needed. This follows Patrick and Eve who have just gotten married. He is from 1885 and she is from today. They met in the previous book. Patrick is trying to get used to this modern world. There are things he likes and things he hates. It is rough for him which is understandable. It becomes rougher when he finds out he has a daughter with a one-night stand who met with a horrible fate. He is filled with guilt and wants to go back and change this and save his daughter. Poor guy. Things happen and our character finds themselves going back in time. But of course...things do not go to plan. Oooo Patrick. Poor guy. I can't imagine this happening. I would do the same thing and as much as I want to see it from Eve's point of view...I found her pretty selfish at first. Yes, yes, it is a lot to ask for to time travel and whatnot, but he will never be happy knowing he could possibly change history and save his child. The scene when Eve first arrives bugged me. It seemed a touch unrealistic honestly. It was fun and I liked the friend she meets when she first gets there, but she was WAY too trusting. Other than that, no issues. This was a good one overall. All-in-all, I enjoyed this quite a bit. The characters were fun and I was worried about Patrick and Eve. I am most impressed that this did so well as a stand-alone novel. Kuddos to the author for that! 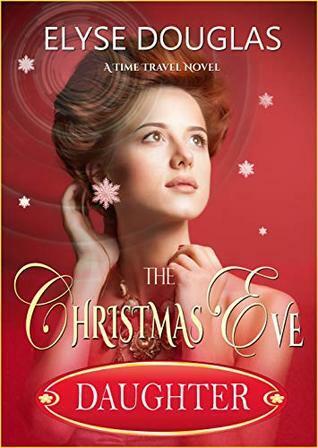 If you are looking for a good Xmas book with time travel give this a go. I'll stamp it this with 4 stars. Sounds good and I do like the cover. Hmmm. Sounds okay. I was just burned by the Time Travel's Wife and therefore don't feel good about time travel books where they fall in love. haha!